Back in the mid-’90s, somebody got hold of the original cinematograph invented by the Lumière brothers and commissioned a project, Lumière And Company, in which major contemporary directors used the primitive camera to make a short film. In order to approximate the conditions of the late-19th century, the producers imposed three rules: (1) maximum length was 52 seconds; (2) synchronized sound was forbidden; and (3) no more than three takes were allowed. The results, predictably, were all over the place, ranging from innocuous footage of Spike Lee’s infant son to a truly unnerving multi-scene nightmare (brilliantly edited in-camera) by David Lynch. But even the weaker shorts are more interesting than they would otherwise have been, simply because they were shot using ancient equipment. There’s an inherent fascination to defunct technology—its limitations frequently metamorphose, years later, into beguiling strengths, which is why there are sometimes vinyl pops or tape hiss on fully digital recordings made just last month. Notice, that I had to resort to an audio example just now. Apart from the very early cameras made by the Lumières and Thomas Edison, there wasn’t, until very recently, much in the way of defunct motion-picture technology. Film stocks and aspect ratios changed, but the 35mm camera itself stayed more or less the same for the entire 20th century. What looks archaic today, ironically, is early video technology—only a few decades old—and filmmakers have begun to capitalize on the low-definition opportunities it affords. The ’80s-set Chilean drama No, for example,about the advertising campaign designed to oust Augusto Pinochet, was shot using the era’s ubiquitous (on Chilean TV) U-Matic camera, giving the film a suitably washed-out look that matched the copious archival footage. And when it came time to make his fourth feature, Computer Chess, Andrew Bujalski turned to eBay and secured a couple of Sony’s video cameras from the 1960s, the better to replicate a low-budget security-cam aesthetic. In this case, the collision of analog and digital is the movie’s very subject, best exemplified in a flashback scene that has one of the artificial-intelligence programmers (Wiley Wiggins) interrogating his primordial PC. Technically, Computer Chess is in black and white, since it’s certainly not in color (apart from one short Super-8 sequence near the end). This image produced by this particular camera, however, is closer to being gray-and-gray, rendering everything on-screen in a uniform flat drabness. The lack of contrast makes it easier to perceive scan lines pulsing vertically up the frame, looking like vague static. Right from the start of this scene, there are occasional glitches, which might be an unavoidable by-product of using this camera or might have been deliberately engineered by Bujalski and his D.P., Matthias Grunsky—I honestly don’t know which. At one point, jagged, diagonal snow briefly envelops the screen; a few seconds later, the lower half of the frame seems to abruptly shift to the right, as if recalibrating the length and/or angle of Wiggins’ right leg. 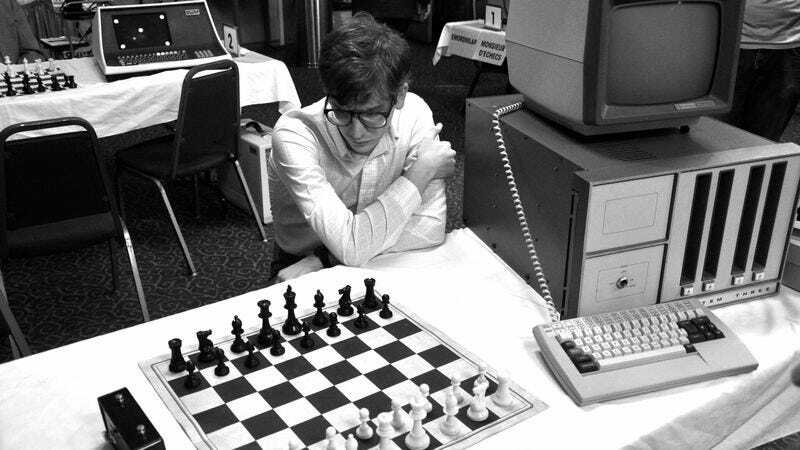 At the time Computer Chess is set (roughly 1980), those would have been considered annoying distractions. Here, they’ve become the text, every bit as important as the dialogue being spoken. They subtly suggest that something isn’t quite stable. Even if those particular glitches were unplanned, there’s no question that Bujalski seeks to construct meaning from what appear to be errors. When Wiggins starts telling his colleague (Patrick Riester) about the “chilling” episode seen in flashback, Bujalski almost immediately throws the audio and video out of sync, and in a very strange way: The viewer can hear Wiggins continue the sentence he’d begun—that is, the audio seems to be correct—but his lips are clearly saying something entirely different. The conventional way to achieve this effect would be the other way around: Have the actor speak the lines as written, then dub discordant audio over the footage. Bujalski’s approach is more disorienting, to the point where I initially thought it was a playback error of some kind even the second time I watched the movie. A torrent of overlapping verbiage follows (emphasizing key phrases like “what I saw was real”), which serves as a vaguely hallucinogenic bridge from present to past. Suddenly, we’re looking at a doughier, clean-shaven Wiggins from what appears to be a camera’s-eye view, with a circular border surrounding a distorted fisheye angle of his office. It’s all very chaotic, in a distinctly analog sort of way. Another piece of outmoded technology now moves front and center: Wiggins’ computer, with its command line and its blocky cursor that can only be moved one space at a time, using the arrow keys. (Yes, this is what all personal computers looked like back then.) My favorite detail, which I’d forgotten entirely until reminded by this movie, is that hitting “return” moves the cursor not down to a potential next line, but to the beginning of the current line—there must have been a rational reason to design it that way, but damned if I can guess what it was. (Anyone?) The impossible Q&A between man and machine that follows is at once funny (“I AM THE ONE ASKING THE QUESTIONS HERE”) and existentially acute, as Wiggins waffles over whether “life” or “love” represents the highest value, ultimately settling on the latter and still getting only question marks in response, along with an ominous statistic regarding how long it took him to make up his mind. There’s a very deliberate glitch—one I’m sure Bujalski created—as Wiggins awaits the answer to his final question, “Who are you?” And then the punchline: a split-second image of a gestating, demonic-looking fetus, followed by the computer abruptly shutting itself down and a smash cut back to the two men sitting at the bar. Would this scene—and, by extension, Computer Chess as a whole—still work had Bujalski shot it with a modern-day video camera? Perhaps, but there’s no question that the lo-fi grunginess afforded by the Sony AVC-3260 provides an extra frisson of dry, comic eerieness. Harmony Korine said of his movie Trash Humpers, which was also shot on outmoded cameras (and edited on two VHS players),that he wanted it to come across like a videotape that somebody just found, unlabeled, buried in a drawer somewhere. Computer Chess achieves that feeling without working overtime to construct a garish freak show. When Wiggins is sitting behind his clunky old computer in his office during the flashback, the degraded image forestalls any consideration of the production design, even though there’s interesting clutter all around him (especially on the shelves behind his back, which can be clearly seen when he gets up briefly to check the connection of the computer’s cable). He doesn’t look like an actor on a set or that kid from Dazed And Confused. He just seems to belong there—a human artifact. That’s precisely what Bujalski is getting at with this film, and using a camera so defunct he had to retrofit it with a hard drive in order to secure its output plays a crucial role in undermining the viewer’s sense of what’s normal. Sometimes it’s necessary to do some cultural archaeology if your goal is to inspire a chorus of: <?? ?